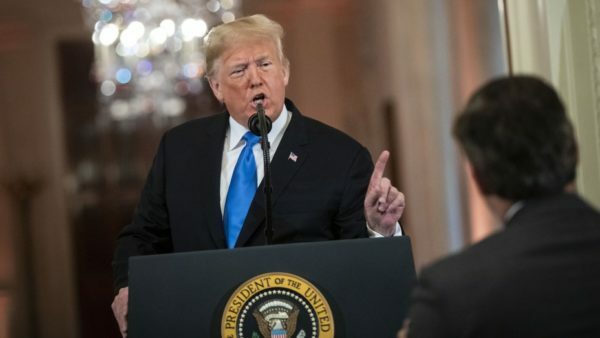 In the most dramatic action yet in the ongoing feud between the media and the White House, CNN filed suit on Tuesday to reverse the Trump administration’s decision last Wednesday to suspend chief White House correspondent Jim Acosta’s “hard pass,” which grants access to the building. The news was broken on CNN’s airwaves. The lawsuit was filed against President Trump, White House press secretary Sarah Huckabee Sanders, former Fox News executive Bill Shine (who runs communications), chief of staff General John Kelly, the director of the Secret Service (which took Acosta’s pass) and an unidentified Secret Service agent. Apparently, it WAS left unchecked during the Obama administration. But he was a “democrat of colour” so he was deemed untouchable. Acosta caused the trouble to start with by behaving petulantly during the conference (i.e. making antagonistic statements instead of asking questions), refusing to give up the mic when asked to and then assaulting the White House staffer to tried to take it from him, so his employer/enabler CNN has no grounds for that frivolous suit they’re filing. Anyone can see and hear that Acosta overplayed his hand and he in fact exposed himself for what he really is, a Grandstanding Egotistical Mysoginist. This will more than likely not go to Court but if it did I would like to think that the Judge would consider the Evidence and Rule of Law. CNN has many more Reporters that have WH Security Clearance, send them to The White House. I think it is shameful that Press Association is playing Politics with this. Again, what if “O” was President and Reporter was a Fox Employee Playing Keep Away with Microphone with Female Intern? Totally different reaction all the way around. Good to see that Fox is supporting this legal challenge. The consensus opinion so far from experts is that CNN has solid footing in this case. CNN:1, Trump et al: 0. Federal judge rule in favour of CNN. Orders pass reinstated.